This Puja is dedicated to Lord Vishnu, who is the creator of this entire Universe and it helps to improve Wealth, Peace, Happiness and Harmony amongst the family members. This Puja is dedicated to Lord Vishnu, who is the creator of this entire Universe and it helps to improve Wealth, Peace, Happiness and Harmony amongst the family members. 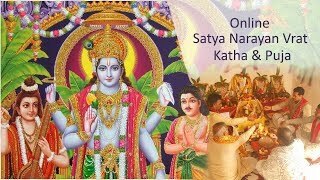 This Puja is traditionally done for success in all areas of life and it gives abundance of luxury and pleasure since Lord Vishnu who is also known as Lord Narayan is the donor of overall Health, Wealth and Happiness. It helps to achieve spiritual and material progress and elevate the social status. The exact Date and Timings of Satya Narayan Katha & Puja will be informed to you through an email and your representatives are most welcome to attend the same.